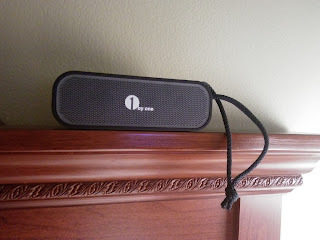 This is a great little speaker intended for indoor or outdoor use. It has a real nice construction with an outer shell made of a rubber type material to be rugged, but the appearance doesn't suffer. It's shock proof and splash proof, though I can really only vouch for the splash proof claim. I let my five year old take it into the bathroom so he could listen to music while he took a bath. I wouldn't want to try to submerge the speaker by any means, but it would be okay in the a light rain, on a dock, or poolside. It would also be fine in the shower. The Bluetooth connection was quick and easy from 3 different devices that I tried it on. The sound quality when paired to a device was a bit lower than I expected, even with the volume on high. I quickly realized that you have to have the volume all the way up on the device in order to use the volume controls on the speaker itself, or the reverse if you want to control the volume from, the device. I found this to be a handy feature. Outdoors I would want to use the speaker controls, while indoors I prefer using the device to control the volume. There are also controls on the speaker for moving to the next or previous song, and to pause and resume play. If you have the speaker paired to a phone, you can even use speaker to answer a call, as there is a microphone on the speaker. 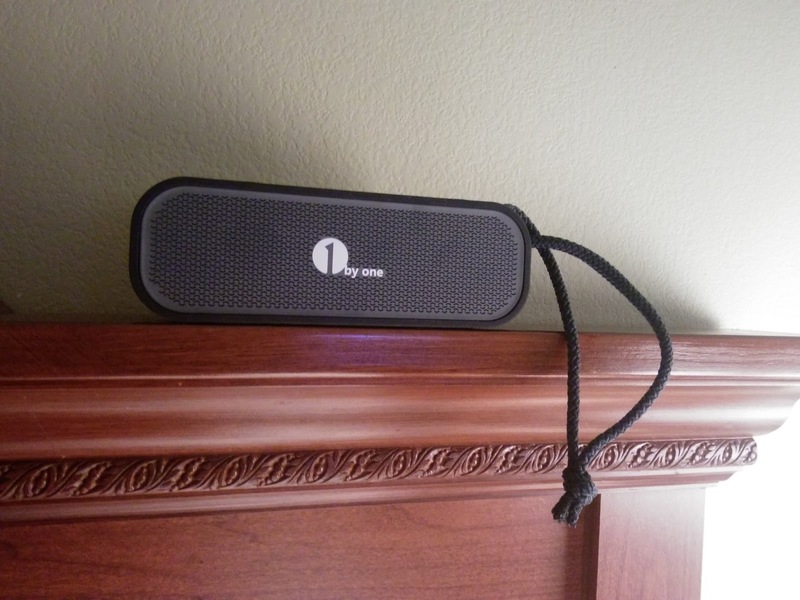 The speaker can also be hooked up to a device via the audio jack. My tablet, which I use almost exclusively for internet browsing, doesn't have the best speaker placement. The speakers are on the back, so it makes it difficult to hear when a video has low volume. I set the Black Box up behind me and paired it to my tablet. It's like my own private little surround sound. If I move from one room to another I just grab the handle and go. The sound quality is quite impressive for such a small speaker. I was pleasantly surprised. Charging takes about 4 hours and is done through a USB cable. I have yet to need to charge a second time, and I've used it for several days. The manufacturer says that you get about 8 hours of use out of one charge. The speaker comes with the necessary USB cable and audio line-in cable but does not come with a wall charger. The only drawback I've noticed is that the buttons pull double duty, so if you are using the buttons to control the volume you have to be sure to press and hold to control the volume or the only thing you are going to accomplish is switching the songs. I don't find this to be a huge issue, but some users may. In all this is a decent little speaker. It's competitively priced at $35.99 and a good value for the money. It's great for a little rough and tumble outdoor use even in mildly wet conditions, which gives it a little bit of a leg up over competitors in the same price range, since most indoor/outdoor speakers have a heaftier price tag. This would definitely be great for someone with a more active lifestyle. I'm looking forward to using it out on the dock at the river this summer. I love the small size of this speaker. My husband still has the big floor speakers. That is a cheap speaker which is good and it is even better that it is good value for money. I love those kind of deals! That looks perfect for my kitchen. Thanks for putting this together. Great review. I have a bluetooth speaker that is a disco ball, but this looks perfect for when I need to just relax and play music without strobe lights. Lol! Awesome I have been needed one and I think this one will be perfect ! 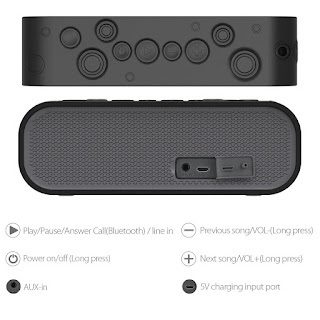 I have come to appreciate bluetooth speakers, especially since I am using a laptop most of the time and watching a movie can be a pain when you don't have good speakers. 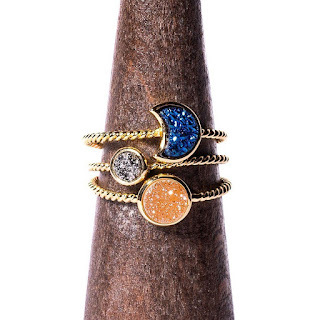 Thanks for sharing your review on this. It sounds like an awesome product! Sound like a great small speakers and its reasonable price. They are really great! Already have one and this is super easy and cute to use. 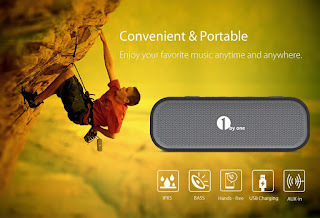 Seems like a perfect gear for an active lifestyle and sound quality is pretty good too! Thanks for sharing such an interesting and useful review! Those are the kind of speaker that I need in my life. It's always awesome to have great sounds when we watch or listen to something. This is wonderful, Bluetooth speaker. I just recently bought a phone, this would be a perfect with it. Great deal! I am currently looking for one and I'm gonna check this out if we have one like this in our local store. Thanks for sharing! It looks like a compact and neat bluetooth speaker. Mine just died on me so I've been looking for a new one. Wow! What a cool little speaker! I got a shower speaker once for review, and I love it, i use it in the living room a lot too! This looks like a good deal and a really reliable one! What a great find. This would be perfect in my skincare studio. I would LOVE that by our radio especially in the summer when the kids are swimming in the pool. My dad has one of this and it is amazing! No wire, great audio!